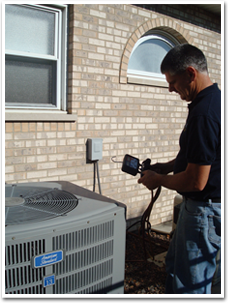 Mike’s Bremen Service provides its signature quality with residential air conditioning service in Orland Park, Illinois and the surrounding areas. You can count on the highest standard of service from our company, a Customer Care Dealer as designated by American Standard HVAC. We don’t take this title lightly, which means your satisfaction and safety are our top priorities on every job. Everyone enjoys the comfort of air conditioning in their home, but no one anticipates the inconvenience caused by a malfunctioning air system. Our highly trained professionals can diagnose and repair your air conditioning quickly and cost effectively by using the most modern tools and equipment in the industry. We’ll have everything back up and running to restore the comfort level of your home. We also install and maintain high quality residential air conditioners in Illinois which run on high efficiency and save you money every month on cooling costs. These energy saving appliances are built to last and are designed with the modern, green consumer in mind. Our air conditioners surpass all government efficiency standards and will keep your home cool without causing harm to the environment. To learn more about these appliances, call us today! Cooling on two stages aids you to save 60% for energy costs. 1. With AccuLink™, your air conditioner talks with the other parts of the system. 2. Your air conditioner charges easily with Charge Assist™. *Allegiance 20 communicating air conditioners require American Standard 900 Series Comfort Control with collaborative inside unit. **Probable savings of energy can differ contingent on lifestyle, settings of system, equipment up-keep, climate, construction of home, and installation of gear and duct system. 1. Beats standards of government efficiency and helps you to save around 50% on energy and lessens greenhouse emissions of gas. 2. Includes a Duration™ compressor that first operates at 70%, and then goes into a succeeding stage on extremely hot days. 1. Passes standards of government efficiency and helps to make up to 47% for energy. 3. Cooling is dependable and effective, because of a single Spine Fin™ coil and reliable Duration™ compressor. 4. Screws, coating, and basepan are actively protecting your system from bad weather. 2. Cooling is consistent and capable, making this a cost-effective choice. 3. The exterior is protection against rust and protects from the heat and the cold.